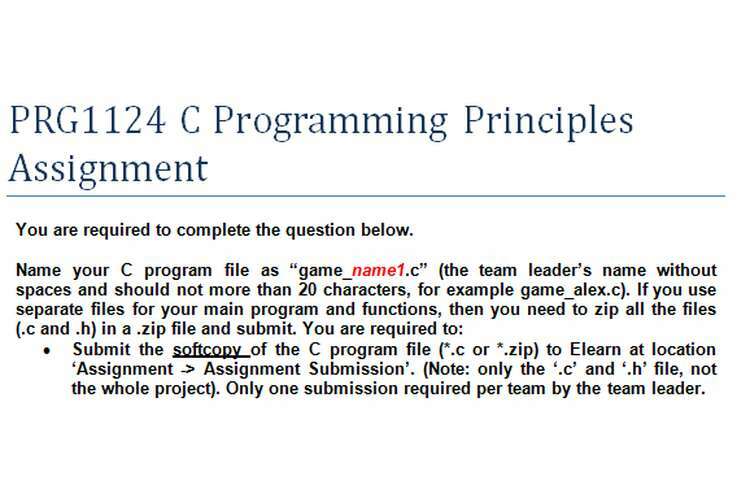 This PRG1124 C programming principles assignment will contribute 20% to your finalgrade. You are required to complete the question below. Submit the softcopy of the C program file (*.c or *.zip) to Elearn at location ‘Assignment -> Assignment Submission’. (Note: only the ‘.c’ and ‘.h’ file, not the whole project). Only one submission required per team by the team leader. Submit the hardcopy report to your lecturer, the hardcopy should include the printout of your code with the cover page and marking scheme, and all the testing output screenshots. The mission of the player that plays the game is to find the way through a masked out map from entrance to exit without stepping on the boom. The game should have a 20 rows x 50 columns map, which you can masked the area with asterisks (*) or any other symbol of your choice. Once the game started, all the booms will be scattered randomly in the map. The booms should not be visible to the player. Your map should have an entrance and an exit. You can indicate it with a symbol of your choice. The player is required to navigate their steps by inputting the option of directions (left, right, top, and bottom) and number of steps they want to move. You’re required to keep the move within the boundary of the map. Show the path that player navigate through by removing the mask in the map. Each player will have 3 lives, a live will be deducted when the player step on a boom. Game will end when player has no remaining lives. The screen should display the number of live of the player while the game progress. Or, game will end when player reach the exit without exhausted all their lives. The solution should have input data validation, and design using proper logic and data structure. You need to use multi-subscripted array and you are required to improve your code structure by using functions. You’re encouraged to add in any additional controls, validations or messages which you think are appropriate. Followings are some sample screenshots of the game (you are allowed to have variances of display design, arrangement or style, as long as it fulfilled the game requirement as stated above). Screenshot 4: Game finished. Player successfully reaches the exit without stepping on any boom. If player step on any boom, game finished and you have to display the appropriate ending messages.